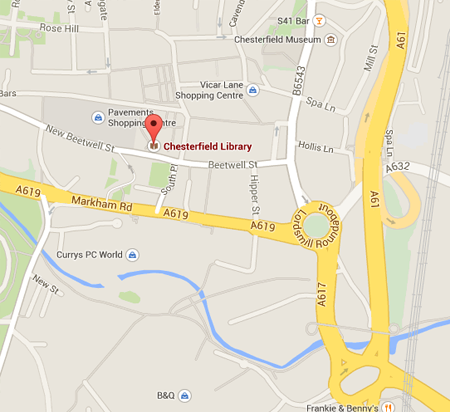 Our venue is the Library Theatre in the town centre behind the Library main entrance on New Beetwell Street. Entrance is through Cafe Browser. There is ample car parking around the town centre and local residents can park for free at concert times. Please note our concerts now begin at 7.30pm with doors open from 7.00pm. This will allow us to finish in time for those using public transport to catch the late buses from New Beetwell Street, just a short walk away. We are able to provide a selection of light drinks, beers and wines which will be on sale in the foyer as you enter the Theatre. There is limited space for wheelchair users and disabled access through the library. Library staff will be on hand to assist you if needed. If you have any concerns in this respect please feel free to contact us. We will do all we can to help your visit go smoothly. From the M1 take J29 follow the A617 to Chesterfield. 1. At the end of the M1 link road take the third exit, A617 to Chesterfield centre. 2. (Do not take the exit into B&Q). 3. At the next roundabout take the second exit, B6543, towards the town centre then turn first left into New Beetwell Street. The library can be seen on your right and access is through the cafe entrance. Most buses will drop you off in the town centre or on New Beetwell Street. To park you may prefer to carry on past New Beetwell Street. Car parks are provided on the right as you head into the town centre and in the actual centre itself - in the so called Dough Nut!